The California based roots-rock-reggae band, Stick Figure, has been touring in support of their most recent album, Set In Stone (2015), featuring a stunning number of sold out shows. The number of sold out shows gives respectability and prestige to the ever-growing American reggae movement. Now, Stick Figure is poised to test the waters across the Atlantic Ocean. Many international reggae fans might not be familiar with the name Stick Figure, but they are certainly not newcomers to the genre. Both of the last two releases from Stick Figure are among the top six highest selling reggae albums, according to the iTunes Reggae Albums Chart. The only other artist or band that can share that recognition is Bob Marley & The Wailers. Stick Figure’s rapid ascent to the “catbird seat” in American reggae can be greatly attributed to their influx in touring since 2012. Prior to the release of Burial Ground, Stick Figure was known as a studio band, as founder, multi-talented musician, singer and producer, Scott Woodruff, would only perform locally. As the Stick Figure name began to make headway in the genre, Woodruff hit the road with a touring band comprised of Kevin Bong (Keyboards/Vocals), Kevin Offitzer (Drums/Vocals) and Tommy Suliman (Bass). It is a rarity to find Stick Figure away from the stage or music festival touring circuit. However, if the band is not on the road, it’s a pretty sure bet that Woodruff and company are in their home studio working on that next chart-topping album for the ever-growing Stick Figure fanbase’s consumption. 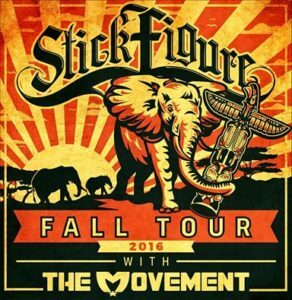 Stick Figure performed all summer long as special guests on the Falling Into Place Tour, hosted by Rebelution and support by The Green, J Boog and Through The Roots. Stick Figure was lucky enough to debut their live performances throughout Europe, supporting fellow touring comrades, Raging Fyah from Jamaica. The tour dates in Europe featured tour stops in Denmark, Italy, France, Spain, Germany, Switzerland and the Netherlands. This happened to be Stick Figure’s first performances in Europe, and judging by their track record in the United States, Central America and the South Pacific, this will not be their last visit to Europe. For those back in America, Stick Figure will be returning to the continental United States in November . Tour dates in the western hemisphere will run all the way through the New Year, as Stick Figure will perform a headlining tour with fellow stateside band, The Movement, spanning tour dates in Kansas, Wisconsin, Missouri, Michigan, Ohio, Pennsylvania, New York, California, and Colorado, among others. The return tour dates in America will run through November 19th and will feature fellow American Reggae-Rock band, The Movement, as touring support. Stick Figure will also be one of the featured performers at Slightly Stoopid’s Closer To The Sun Music Festival in Mexico on December 14th. Needless to say, Stick Figure will continue to push their music across all borders and all demographics. For more information on Stick Figure, follow the links below.